Save the date for the Wall Raising Ceremony on June 7th at 8:00 a.m. to 4:00 p.m.
Come prepared to work after wall raising. We are so excited about jump starting this project! 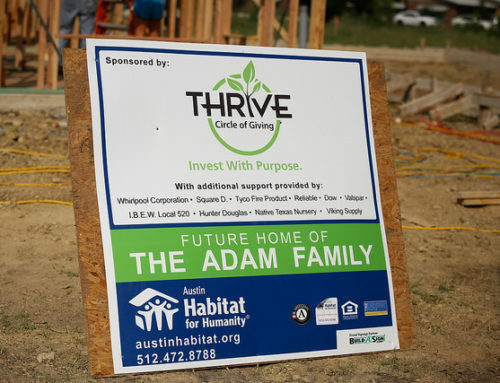 If you would like to participate in the Circle of Giving, please visit www.austinhabitat.kintera.org/thrive. Tasks: Day one: Walls up! Framing and painting. All volunteers are required to go to www.austinhabitat.org/index.php/volunteer to complete the Volunteer Registration and review the Volunteer Orientation materials. Be sure to print, fill out, and sign the Release of Liability. Please bring the release form with you to site the first time you volunteer. This Release of Liability must be resubmitted every calendar year. Additionally, we require ALL Volunteers to complete the HFHI approved Lockton On-Line Safety course titled “Volunteering on a Habitat Job Site”. On your project day, please arrive by 8 A.M, dressed appropriately, prepared for the weather and ready to work! Our staff works tirelessly to get families into their homes on time, and ask all volunteers commit to a full day, (8 A.M. – 4 P.M.) when volunteering; Shifts and early/late departures break project momentum. There is no volunteer parking allowed on Barteny Cove. All parking is one street north on Breve Cove or along Gilbert Road.